A few months ago, we began praying about the HLM teams for 2016. Specifically, we prayed that God would provide guidance and a common theme for this coming year. God provided and we focused in on Micah 6:8 "And what does the Lord require of you? To act justly and to love mercy and to walk humbly with your God." 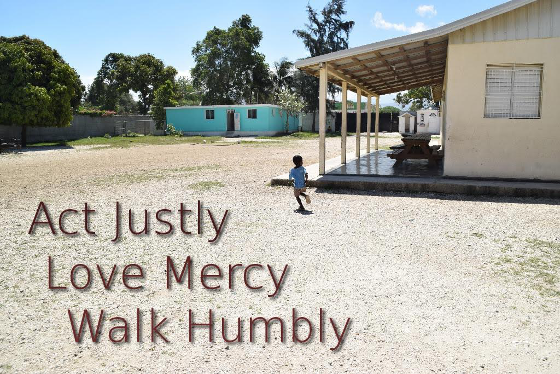 Our Haiti Lifeline Team is excited to announce the theme for our 2016 teams: Act Justly, Love Mercy, Walk Humbly. Knowing that God hates iniquities and injustice, that He has taken a stand with the widows and orphans, a stand for the downtrodden, and a stand for those who often do not receive justice, we understand that through Haiti Lifeline, God has given us the opportunity to "act justly" in Haiti. Knowing that both justice and mercy are foundational to God's character, we understand they should be foundational in our ministry. Let us show mercy and grace to those we work with and alongside in Haiti. Knowing that often, God's people depend on their own abilities rather than Him, let us learn what it is to walk humbly, centering our lives and focusing our teams on Him. April 15th-21st: (Traveling home today!) This medical team will see the Lifeline children, the community people from Croix-de-Bouquets, and do a mobile clinic in the mountains. June 13th-20th: Vocational team will put on a week long camp for the older Lifeline children. Last year, the teenagers were able to choose between classes on English, First Aid/CPR, Mechanics, Construction, and Nutrition. July 5th-15th: Church team will put on a VBS for Bethel Church in Croix-de-Bouquets, as well as possibly three other mountain communities. Last year, this team did a week long VBS and taught over 1,000 children. July 19th-26th: Church team will be putting on a VBS solely for the children at Lifeline. 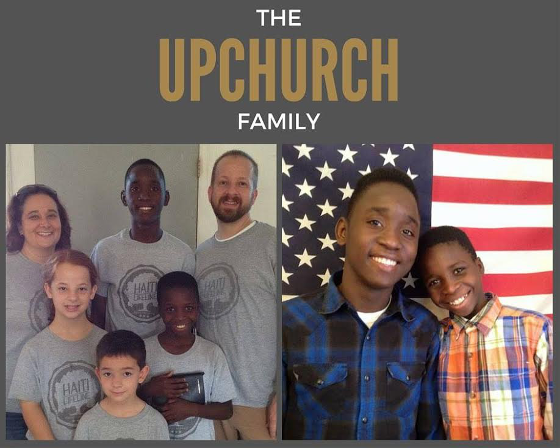 We are excited about this team as it allows us to partner with a new church from Houston, Texas. October 25th-31st: Medical team will see the Lifeline children, the community people from Croix-de-Bouquets, and do a mobile clinic to the mountains. Also, this team will hopefully be constructing the new playground set for the Lifeline children. November 1st-7th: Medical and dental team will provide care to the pastors and their families who have traveled to Croix-de-Bouquets for the pastor's conference. Also, for the second year in a row, we will be sending pastors and teachers to teach at the pastor's conference at Bethel Church. 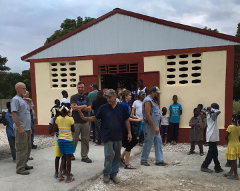 Fall 2016 Church Building Team: There is a possibility that we add a team to finish one or two church buildings in Haiti. The dates for this team are still tentative. As many of you know, Lifeline relies heavily on annual shipments sent through the U.S. Air Force Denton Program. According to this article, "The Denton Program was created to allow private U.S. citizens and organizations to use space available on U.S. military cargo planes to transport humanitarian goods to countries in need." Shipments usually include a literal ton of grain, grown and donated by farmers in Kansas, other food items, clothes, shoes, and supplies. The 2016 shipment also contains the new Lifeline playground equipment as well as trusses and roofs for two more churches. The shipment was prepared and ready to go in July 2015, but due to unforeseen delays, it is still waiting to be shipped. It should move to the next delivery stage in May. Please continue to pray for a quick delivery. Four long-awaited adoptions have reached their joyous conclusions in the past four months. These families have closed the door on the angst of the wait and opened a new door to the many-faceted beauty and struggle of melding lives together. They are now living the day to day definition of adoption. As we settle into our new normal, I finally have a few moments of stillness to reflect on the last four whirlwind months since our boys landed in the States. Four years of waiting, prayers, tears, impossible deadlines, and missing paperwork are over. Our boys are home. HOME. We are together. And it is so good. We have had a relatively smooth transition as we learn, and continue to learn daily, to be one family. Daily routines have been established. The initial rush of medical appointments is over. Life is beginning to fall into an ebb and flow that comes easy to us. But that does not mean there are no challenges. I constantly second-guess my parenting decisions, trying to balance discipline and teachable moments and "fairness" for all four of my children when they have such different backgrounds. I see my two biological children struggle with trying to grasp the concept that life cannot be "fair" as they understand fairness. I see my two adopted children struggle to make sense of this entirely new world. And I see their struggle to communicate with us. And I see their brains get so, so tired from the struggle. These struggles are woven throughout our day, between piano lessons and Tae Kwan Do and soccer practice, winding their way through school work and play. And we all soldier on, handling each challenge as it arises, sometimes successfully, sometimes not. Thankfully, more often than not, we can laugh together at the challenges. This is where I see the Holy Spirit at work so clearly. I see the fruit of the Spirit manifest itself in the joy that Rijkard (Gaba) exudes wherever he goes. I see the gentleness of the Spirit in Schnaider as he plays with his new brother, Gabriel. I see patience in my husband, Chris, as he comes home tired from a day at work, but always ready with a smile and hug for every child who runs to greet him at the door. I see the kindness my daughter, Natalie, shows as she chooses to place the wants of her siblings above her own. And I see my youngest, Gabriel, learn self-control as he learns to share all his toys and his room with two new brothers. And I thank God, in awe that He is allowing me to parent these amazing children. In awe as I watch the Holy Spirit work in all our lives. in awe that such beauty can come from such ashes. I have to laugh at some of the things we have learned these past four months. Washcloths are NOT tissues. Seventy-five minnows will NOT fit in a ten-gallon tank. One pan of brownies will NOT satisfy four hungry children. Every word that begins with "h" is NOT "horse". Teeth turn into dollars when you put them under your pillow. Rice with smashed avocados is delicious! Super-skinny jeans are hard to find in the Midwest. It was a GREAT idea to get rid of our couch and replace it with four bean bag chairs! Life after adoption is good and hard and wonderful and challenging. It is full of big miracles (our boys are home!) and small blessings (we found a Haitian barber right around the corner!). God has His hand on all of it. All the joy, all the sorrow, God is there. One of the blessings of traveling to Lifeline is being able to witness and participate in the morning and evening devotions. I have learned, after observing several times, that there is a liturgy of sorts that takes place. While the content is always lost on me, it is easy to see the emphasis on praise and prayer. Several opportunities for prayer are woven throughout each gathering as everyone stands and a gentle murmur begins, voices again blending together, but each praying individually. It is then that I sense the wonder of God, knowing he hears each one. I hope that some day my fledgling Creole skills may allow me to hear and know their words, but until then, I can see by their actions that they are living out Hebrews 4:16. Wisdom, health, and strength for Daniel & Nicole as they make decisions and lead the church and orphanage. Direction and discernment for the HLM board. Praises for the four families who have received their children home and prayer for them. Please also continue to pray for efficiency and quick movement in the Haitian adoption system for the several families still waiting. Continued protection and provision for the children at Lifeline. Quick delivery of the Denton shipment. Peace and cooperation within the interim Haitian government and direction for the election. For the medical team at Lifeline now and for those who they will serve. I figured it would be a hit. After all, my children watched it and danced to the music and they donâ€™t even know what it said. Then they watched it again. And again. The plan was simple enough: obtain a used tablet (generously donated by a friend), get my IT staff (aka my husband) to convert it to a simple video player and upload two videos, make prompt delivery to Lifeline, share videos with children. The reception was remarkable predictable: On first listen, faces pressed in to see the little screen. Then the music started and they instinctively began move along to the infectious tune. Before the song had finished, every viewer, child or adult, heartily sang along, as if they had known the music all their lives. That little tablet was all the rage. If I heard it once, I heard it a thousand times, â€œCharis, Alfabe Kreyol?â€ The kids made their requests then jubilantly played the songs over and over, singing and dancing along. An alphabet chorus echoed back and forth, with or without accompaniment by the music. The songs also provided the perfect opportunity to test drive the placement of a tablet in the Lifeline Library. 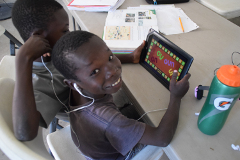 Although the tablet has not yet taken up permanent residency in Haiti, I am happy to report that it survived the week with no injuries. Not a single drop, crack, or even technical difficulty. The kids respected the rules, returned it promptly for charging, and shared it (albeit, sometimes reluctantly) when told. 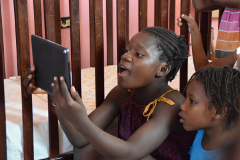 There were no games or apps installed, so no distractions, but it took no time at all for the children to discover the handful of other videos also downloaded by the aforementioned IT staff: animals, race cars and rocket launches. With all the fun, it is easy to miss the most exciting fact: each of the children were learning about their language in their language. Here in the US, this is something we take for granted. We can do a quick youtube search and find hundreds of variations on the theme of learning phonics. This hasnâ€™t been the case for Creole. But now, these videos explain basic phonics rules and teach the Creole sounds represented by more than one letter: an, en, on, ou, oun, ch, ng, ui. With the songs fresh on their minds, this immediately translated to better reading as the children could then start to recognize the pattern of these sounds in written words. Sitting with the children in the library and seeing them make connections and begin to read more fluently--now that is something to get excited about! 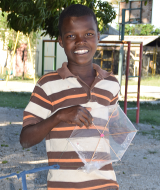 Haiti Lifeline Ministries is raising money for the young adults that age out of Centre Children International and are trying to finish their high school degree. All of these young men and women are receiving some support but still have significant shortfalls to meet basic living expenses and tuition costs. Young adults that still need support: Guerby, Mackenso, Luckbert, Jean Eddy, Camille, Junior, Derigene, Scherlie, Nancy, Misterline, and Aicha. Go to www.haitilifeline.org/sponsorship to find out more. Another church building has a roof installed thanks to the work of the January team. Lisa Barker, along with her 15 year old daughter, joined the team in the role she referred to as â€œsupport staffâ€, which meant she didnâ€™t place any beams herself, but her work kept the team members going with a good supply of food. The Brush Arbor church was a short driving distance from the Lifeline orphanage compound, so this team stayed there and drove back and forth for the work. This was a collaborative effort between Haitians and Americans. 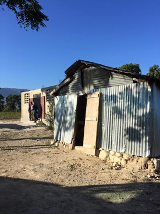 The Haitians built their structure and our team came in to put on the roof. The hard working men on this team accomplished the roof assembly in two days..amazing! They also built pews and a pulpit for the new church. The interior was painted and the locals decorated their new place of worship joyfully. Some on our team provided Creole Bibles for many in the congregation. The dedication service that was held at the end of this project was a special time for all of us. Back at the ranch, er, Lifeline, some of our guys worked hard to build new wall to wall cabinets in the clinic. They turned out great and will be a huge help to future medical teams. The rest of our time was largely spent doing small things around the compound and visiting with the kids who live there. Always time well spent. Copyright Â© 2016 Haiti Lifeline Ministries, All rights reserved.